One of the best decisions I made last year was to forfeit my subscription to cable television; if it doesn’t seem like that big of a deal to you, I commend you – because you’re right: it shouldn’t. There were late nights I would stay up, scrolling through obscure channels asking my Twitter friends where the hell I could actually watch the ‘News’ – you know, with facts, not talking heads? It was then that I realized how ridiculous it was that so many people are tethered to a static box, when their imagination and feet could take them infinitely outward and inward. When I moved in with Danny in the Spring, I made the decision to quit cable all together – and to this day, it’s one of the best decisions I’ve ever had. Now, not to get it twisted – we’re heavy intenet users that are in lust with the capabilities of Apple TV and between the three of us, finagled manageable subscriptions to Hulu+, HBO Go and Netflix. Sure, I miss live sports games (which, I could remedy with a NBA Package), and Homeland hour where I’d turn off my phone and glue myself to the big screen in my living room; but now that I’m not subscribing to someone else’s schedule, my life feels more free – and I honestly don’t remember what it’s like to have cable, nor do I miss it. Not to mention, renting a movie from the iTunes Store finally seems like a great idea; not only is it cheaper than going to a movie theater, sans the nostalgia of course, but they download quickly, come in HD quality and are available for 24 hours. Working from home, I tend to marathon through TV Series efficiently and can ingest multiple documentaries in a day – suffice it to say, I go through a lot of options and sometimes, come up empty handed. But sometimes, there’s a rare gem or few that catch my fancy and I’m uber stoked to share them with you. Heading into the Holidays, I’m sure you’ll find yourself with some extra downtime – either solo, with friends or family – so feast your eyes on these fancies. 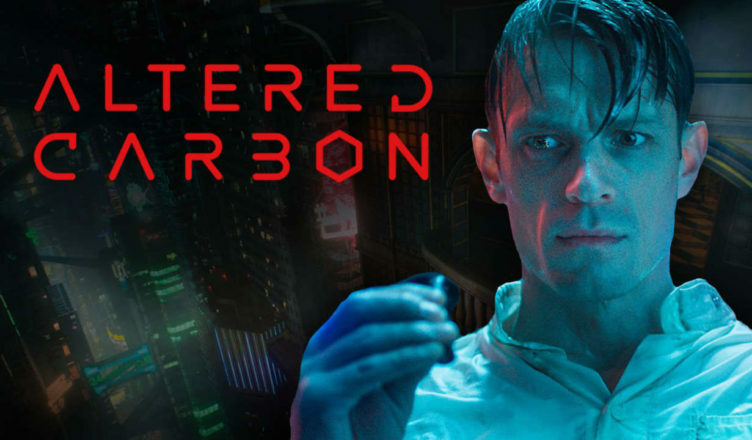 Some of these have been up for a minute, others are hot fresh on Netflix’s streaming shelf – either way, they’re downright enjoyable, humorous and intellectual pursuits that in one shape or form I’m sure you’ll enjoy. Frequencies (OXV: The Manual) . Imagine a parallel universe where your life trajectory is calculated on the frequency that you give off; how would that effect your interactions, your passions, your destiny? 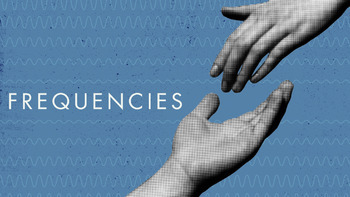 Made with the same dose of intellectual British Humor as the latest ‘Hitchhiker’s Guide to the Galaxy’, Frequencies is a wonderful thought experiment wrapped in a romantic comedy. An absolute must watch with your best friends, significant other or even better – on a solo mission, this is a movie for anyone who’s pondered the eternal debate of ‘Fate’ versus ‘Free Will’. I’ve already watched it three times, and each time it gets better and better. The Current Civil Rights uprising in America, a community outrage against institutionalized injustice, has compounded socio-economic roots, many of them found within the taboo of Drug use. As it stands, the majority of our incarcerated population is there because they’ve chosen to alter their state of consciousness – the one part of our body that we deserve a sovereign right to. In the United States, we gave 5% of the World’s Population, but 25% of the Global Prison Population with a whopping 2.5 million people behind bars. And now, in 2014 – we have for profit prisons that need a 90% retention rate to stay in business. The War on Drugs has been happening since the 80’s, but the War on Drugs is a War on Humanity in Masquerade. By systematically keeping down part of the population, part of the world – people are dying, wars are ravaging countries, and the illegal drug trade has become the third most profitable industry in the world. Instead of supplying, infiltrating and perpetuating this negative feedback cycle that’s become of the ‘War on Drugs’, the money could be better spent on education, mental health and awareness. A pivotal, important film – Breaking the Taboo focuses on both a failed National campaign against drug use and global war on drugs and the failures set in stone since the launch of the United Nation’s Singe Convention on Narcotic Drugs. Lemur Lovers, rejoice! Slightly dopey, incredibly lovable and definitely worth a few laughs – this Animated Netflix Original TV Series comes from the Dreamworks camp and is based on the successful movie series Madagascar. The series focuses on my personal favorite character: King Julien – the enigmatic, slightly inane leader of the Lemurs. Great for some late night laughter with the family, or even just with your friends after a few drinks – All Hail King Julien packs a hearty punch and I’ve absolutely loving it. I don’t know about the lot of you guys, but I refused to see Anchorman 2 in theaters based purely on principal. The first one, an undisputed cult classic, is still heavily quoted among my friend group and I was a little scared to have it get ruined. There were lots of laughs, but the story didn’t pull together quite as nice as the first flick; but it’s definitely worth the watch if you haven’t had the chance. As a guy’s girl – basketball playing, whiskey drinking, foul mouthed and extra sassy – there was a whole lot of fun to be had in the world of ‘Wolf of Wall Street’….as long as you were either male, or a whore. The fast paced, financially driven world only seems glamorous from the Hollywood perspective, and in that regard ‘WoWS’ is a fun romp on the WASP side with predictably tragic, yet endearing, results. Either way, it’s one hell of a ride – and perfect to toss on if you’re getting back together with your High School friends back at home over break. Video might’ve killed the radio star, but if the Buggles had a revival today we very well could be chanting about the triumphs of streaming media over cable television. Over the last ten years alone, movies, cartoons and computer games have evolved into television shows and syndicated shows have enticed prequels, sequels and spin-offs. One of the cornerstones of the 90’s childhood – Boy Meets World – has been rejuvenated, and now Girl Meets World proudly airs on the Disney Channel. Teenage Mutant Ninja Turtles was a cartoon, into a live action movie, back into a cartoon, etc, etc. With the revival of older shows, and arduous endurance of things that I’ve always refused to care about like Soap Operas, Survivor, LOST, Maury and the lot – the only glimmers of hope I saw in that bleak black box were sports, like the Olympics or NBA, movies on FX and various bouts of HBO and Showtime’s catalog of epic Television. So, when I moved into my boyfriends house this past April, I decided it was finally time to cancel my Time Warner Cable Account; and thanks to ample use of Apple TV, Netflix, Hulu+, communal accounts and streaming media – I’ve never had to look back. As of this past April, services like Grande Communications, RCN and Atlantic Broadband have offered Netflix on top of their regular cable service and earlier this year Time Warner struck a deal with Netflix to bring it to the boxtop. Unfortunately, now that TWC has merged with Comcast – this transition’s been pushed back, possibly indefinitely. If you were born in the 80’s, you-me-we‘re part of a unique macrocosm of the community that both remembers dial up modems and Network television with ants on the screen, and T3 lines with streaming content in real time. We’ve spent the better part of our adult lives as entrepreneurs of the internet – skillfully navigating between the two. Combined with our willingness to constantly ‘GTS’ (GoogleThatShit), we’re in general more apt to both search for and discover better deals for the media we’re devoted to. Conversely, with the way the current job market is, most of us simply can’t afford a full on Cable package either. 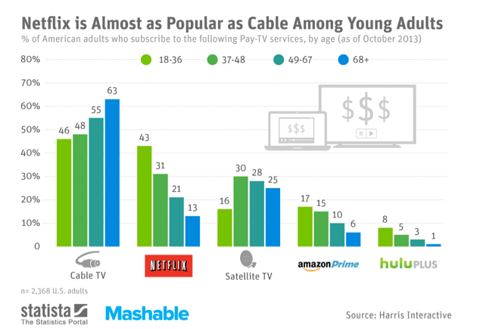 So, over time – more and more of us have been converting away from cable. To put it in quantifiable perspective, there are almost as many Netflix subscribers as there are Cable subscribers for my age group. And after looking at the price break, it’s no wonder. Apple TV comes with a one time cost of $99, roughly two months of your traditional Cable. And on top of that, Netflix subscriptions run for roughly $8 a month, same with Hulu+. Add them together and you’re still spending less than $20 for ample amounts of content! Netflix is becoming so big, that its even in the process of being added to Cable TV. As a good friend of mine always joked – if a little is good, more is obviously better. And when it comes streaming media, I happen to wholeheartedly agree. Between my parent’s AT&T Uverse Account, my Netflix account with a DVD option, my housemate’s dad’s HBOGO account, and his Hulu+ account – we have access to the same amount of content, if not actually more content, than the average bear. Find a series marathoning friend and trade passwords, even better – start watching shows en masse; it’s so much more fun that way! Primetime stations tend to throw most all of their shows onto their website and when it comes to the news well – AppleTV has local ABC stations, as well as NPR. Plus, it’s not like there was much real news on television anyways; you’re just as likely to catch a breaking story on Twitter or Reddit anyways. What streaming media subscribe do you subscribe to what what are your favorite shows to marathon? Ditch your wheels! Head out on foot, with skates, on a bike or with public transportation – did you know that there are some gorgeous smelling flowers just three blocks away from your house? Well, now you do! When you’re with company – do the polite thing and turn off your phone, or as a baby step – try just your mobile network. When you’re with good company; not like you need to see how many likes that rant on Facebook got you while you’re enjoying your surroundings, right? Turn off anything with an electronic pulse and cultivate some creativity; arts and crafts shouldn’t just be for elementary school! It’s been a while since I’ve done a ‘Tech Tuesday‘ segment – but that’s because there hasn’t been a whole new lot to report. From my perspective, ever since the big Apple unveiling all has been more or less quiet in the world of beeps and bit logic – but, this week I definitely see some moving and shaking on my radar. When you breathe, sleep and eat tech, there’s nothing quite as exciting as getting to preview and help debug early renditions of applications and web clients. Back when AOL Instant Messenger was still fairly relevant, they had a portion of the webpage for their chat client devoted to Beta testing – we would get the client first, sure – there’d be some bugs here and awkward application crashes over there, but overall it was pretty neat playing around with brand spankin’ new features. When the Facebook timeline was introduced and everyone was bitching about converting their profile, I took the exact opposite approach. Because I knew I’d be forced to use it anyways I decided to become an early adapter. When Timeline was introduced, Facebook wanted any and all willing developers to get with it and start creating new applications and widgets for the Timeline – but for them to use the API, they first had to understand it. This meant that developers were given a first pass at the timeline. Am I a Facebook developer? Definitely not! But, that’s pretty inconsequential at this point: I told Facebook that I was and that I wanted to create a new application, but I was required to produce or release a public, or final, product. The next time I opened up my user profile – babam, I was Timelined. Currently, Firefox has a web browser sitting in Beta testing – just waiting on people like me, and maybe even you, to come by and give it a whirl before it’s rolled out to the general public. Why is it worth testing? Firefox just added Facebook messenger to their Beta test. So now, instead of being forced to keep a Facebook tab open to facilitate chat – meaning you can roam the web as you please with your posse in tow and stop liking so many cat pictures. To boot, I can finally do away with the Facebook Toolbar add-in that I’ve been so loyal to over the past year. Huge huge huge news for Disney lovers, Netflix addicts and anyone paying attention to streaming media! 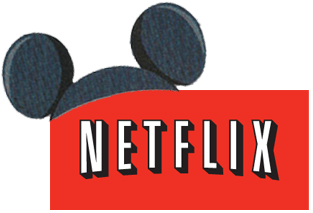 This morning, the Walt Disney Studios and Netflix got together and kicked out a multiyear licensing agreement granting Netflix exclusive rights to Disney’s movie library which includes catalog titles, direct to video titles and New Releases. Typically, this content is reserved for HBO, Showtime and Starz which make this a huge deal in the studio world; marking the first time a major Hollywood movie studio granted rights to a provider of streaming content over a premium TV network. Starting on Tuesday, members can start perusing the Disney catalog titles and by the time Spring of 2013 rolls around, Netflix users will be able to watch direct-to-video releases the same day they’re released in stores. Unfortunately, some movies distributed by the Walt Disney Company are still under contract with Starz and those won’t be rolling out until 2016. This deal comes approximately two years after Netflix began streaming Disney and ABC Family TV shows within weeks of the air date. 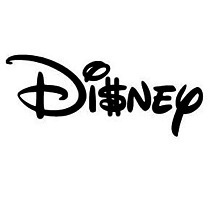 To me, this has super interesting implications – first of all, the Disney online store is saying goodbye to the world; meaning that Netflix will be the one and only place to go if you want to stream Disney content. Secondly, with a decreased presence on Network and Cable television, it should catapult amount of monthly streaming subscribers on Netflix – a path they’re willing to walk since they’re planning on phasing out their physical DVD services. Secondly, since Disney has a hand in the ESPN cookie jar – would this pave the way for streaming live sports content? You could even have MLB, NFL or NBA streaming packages that you can subscribe to through the ESPN website or strictly through Netflix – the possibilities are basically endless!